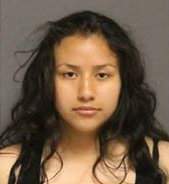 On March 12, Santa Ana resident Jocelyn Cano, 21-years-old, was arrested by Tustin Dectives, without incident, at a residence in Santa Ana. Cano has a lengthy criminal history including auto theft, burglary and narcotic-related arrests and is currently on parole. Cano was booked into the Orange County Jail for carjacking, attempted carjacking, brandishing a weapon (a knife), and assault likely to cause great bodily injury. Another DREAMER allowed to be here by the illegal president?